Today, I was asked to monitor the MCC birds for the day. Yay! I love that assignment. I arrived on the garage top at 9am and scanned the sky and known perches, but alas, no MCC peregrines. I did see something steaming in the cool morning air on the top of the stairwell roof, so I swung my scope around to look it over. As I had suspected, it wasn’t a pretty site. However, the freshness of the kill (a Yellow-bellied Sapsucker) meant that I’d just missed one of the adults eating on the stairwell. Well, of course I did! And it was probably Max. And he was probably eating while holding his banded leg out, nice and steady! An hour later or so, an adult flew in from the SE, basically commuting up Congress. It soared around the backside of the MCC and then angled up to land on the SW corner of the EPA building. From my perch, I can’t see anything up there, so I settled in to wait it out. 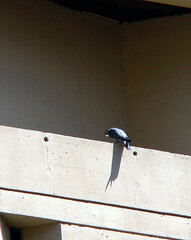 A half hour later, an adult came in and landed on an entirely new perch – the red brick building directly to the north of the garage. I quickly relocated and watched as Max deftly plucked a pigeon on a wide ledge on the SE corner. I’ve noticed that nearly every building, including the EPA and the MCC, have at least one side under some sort of construction. I suppose that is part of why the falcons are sitting on new spots these days. It sure makes the job of finding them more challenging! I was very happy to see Hercules settle down on the Monadnock ledge at a little before 11am. That favorite spot from last year just didn’t look right without her there! She settled in for a good preen and I happily watched through my scope. Last week, I bought a Nikon Coolpix S9 from a co-worker for $50.00. It was brand new, but he’d recieved several for recent birthday presents and was happy to see them go to new homes. He told me that the lens size was perfect for digiscoping, so I should try to look for a rig that would work with my scope and the camera. Since Herc was taking some down time, I decided to try some hand-held digiscoping with the new little camera. I took about fifteen shots over the next hour or so, most of which actually weren’t horribly blurry. This camera is going to be GREAT with a rig. I can’t wait to find one. Finally, Herc took off and I saw her round the corner to the west side and land out of my sight-line. I looked down at the buildings across the street and sighed longingly. 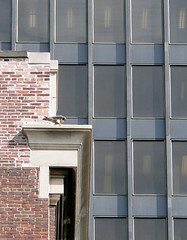 I noticed that the LaSalle/VanBuren ‘el stop was directly across from the nest ledge, but it was far too short to give me much of a look. Oh well! Better than nothing! So, I packed my things and headed for the ‘el. I paid my fare and went out onto the ‘el platform. Surprisingly, my look was better than expected and I instantly spotted one adult snoozing in the southmost niche. I decided not to set up my scope, since I was hoping to sit up there awhile and didn’t want to give the CTA a reason to give me the boot. I got a paperback book out and sat down, opening my bag so I could get quick access to my binocs and camera. Over the next hour and a half, I watched the two adults land on the northmost and southmost ledges about five times. Hercules seemed particularly keen to land and stare down into the northmost niche, softly calling. Mary thinks that means chicks. She hopped down in there at least twice and Max hopped down once, every time with food. So, yes, I think chicks as well. Near 2pm, the ‘el platform started to get hot enough that tar from between the planks of the platform was sticking to my pants. I decided I needed to go look at my pictures and get out of the heat. Right before I left, Hercules came down onto one of the annex lighting fixtures, maybe 10 feet over my head. We looked at each other for a few moments and then she began to preen again. Nice! ~ by Steph on May 2, 2007.